We are young peasants, land-searching, reapropriating, cooperating and working in all types of agriculture-related fields around europe. we are determined to create alternatives to the agro-industrial-complex and capitalist globalization. we struggle for practical, local-based solidarity-networks with a conscience of the social and ecological issues related to the imperia of industry and their states. our agrarian fight is a long term and mostly localized one, but resistance for more autonomy and against authorities can also puncutally rise – and travel to express dissent. We will make agricultural topics a content within the upcoming G20-summit-protests in Hamburg and beyond. We believe that we’ve got to overcome the time of resource-destruction and cultural-war against small-scale-farming – as a matter of survival. We declare ourselves critics of elite-led politics: good things come from below! The elites of G20 agreed in meeting in the harbour-city of Hamburg in july, so some of us agreed on meeting there as well, to bring up food- and agriculture-related issues during the protests. Mass-disobedience already seems to take shape with hundreds of thousands expected on demos and blocades of the summit and the harbour during the action days in july. We call all farming-friends on supporting the protesters practically with food and logistics as only well-fed protesters can stop this summit! The G20, an alliance of the dominant nation(confederation)s of the world will bring forward more agreements that don’t fit us. they might talk about “migration issues” but only with the aim of containing, seperating and managing peoples lives. They strengthen the freedom of markets and keep restraining the liberties of humans. “green-finances” as another key issue of their mafia-meeting are just another spectacular try in absorbing ecologist themes for capitalist and speculative monopoly-type-development. Their understanding of globalisation results in exploitation, forced work- and (peasant-)migration, war, climate-chaos as well as a rising dependance on the capitalist, energy-excessive and extractivist model. it’s big time for a new global riseup towards an ecologist, foodautonomous and anticapitalist future. Our strength stays the everyday struggle in working the land, the forrest and the seas. but we have to raise our voices in concrete jungles sometimes. The food- and health-issues remain central to give more independance to the people. small structures still feed the world and fight for local balances as all investigations could show. but agreements coming out of their summits have never significantly arranged the systematic injustice within food-sovereignity-issues on this planet. Their “game of share” on resources between the “leading countries” and the destruction of sustainibility-chances for the “countries of the global south” keeps going on for too many decades. as their input in chemistry, gmo, seed-monopoly and energy-intensive food-chains grow, peasants are chased and rural communities displaced by capital interests. We got to defend diversity and give acces to land to all – without forgetting to chase the states and the industry from these fields. We think long term – the time is now ! We want solidarity and emancipation – not power: our issue is the defence of spaces and people who are threatened by reactionary and repressive politics. We support the fights of our companer@s who must leave their land struggling against the progress of overdimensioned useless projects and keep up the memory of those who got shot by the killers of big landowners around the world. Not the agrarianministers of those G20- that met in january in Berlin and not their bosses meeting in Hamburg will resolve the land- and food-crisis: they aim for profit and growth, not for the necessary radical strengthening of peasant rights, peace and diversity. It’s the peasants and landless that carry solutions to the crisis of growth, property and elitism. We can feed the planet and we will! We look foreward in meeting in the city of Hamburg with tens of thousands of activists from worldwide emancipative and revolutionary movements. 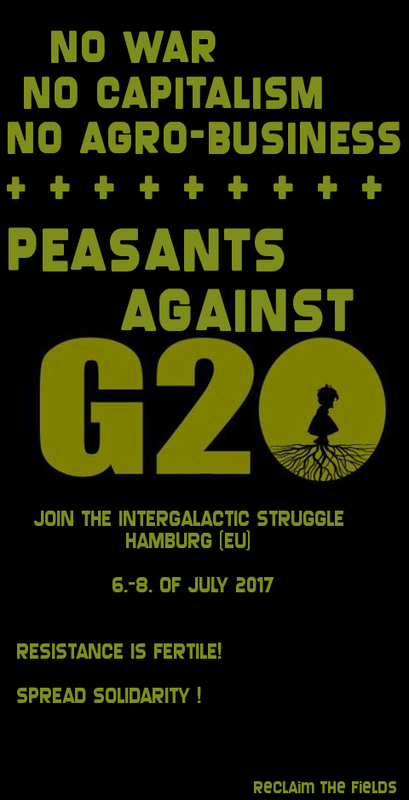 They won’t keep their business up a usual – join the protest against G20! Another world is possible – Make resistance great again – Defend la pacha-mama!